1. Yeah, but I don’t have the time. 2. Yeah, but I don’t have the money. 3. Yeah, but I don’t have the education. 4. Yeah, but I don’t have the talent. 5. Yeah, but I’m not pretty (handsome, smart, strong, or ____) enough. 6. Yeah, but I have too many other things on my plate. A journalist I know wrote me on Facebook to ask what I what I would say to a sad reader who is disabled at 57 and in credit card debt. She gets a small monthly disability check and has a house paid for, but nothing else. Did I have any words of wisdom for her? People do get themselves into some pickles, don’t they? I know they want a magic answer to have their debt disappear, but it’s going to take money, which means it’s going to take work. I’m sorry to hear you’re disabled and have debt that needs to be paid off. The good news is that you have a house that’s paid for. Lots of people don’t have a big asset like that, so congratulations are in order for your accomplishment! I know life gets tough sometimes. It’s hard to keep the faith that things will get better when the economy is in trouble and nothing seems to point to a better day. There is a better day coming, but you have to take the right steps to make sure you’re in the sunlight when that day arrives. There is no magic answer. You have to find some work you can do to bring in money – either employment in a job or start your own business. I met a woman once who owned a very successful employment agency. When I asked her how she got started, she said she was in a serious car accident and was hospitalized for almost a year. She was her own sole support, and she said she had to find a way to make a living from her hospital bed. Immobilized, she couldn’t move anything but her mouth, so she said to herself, “Well, I can talk on the phone so I’ll do telephone sales.” And that’s how she started her business. What talents or skills do you have that people might pay you for? Look in the want ads, post your resume online, talk to friends, old employers, or start your own business. It is only your will and determination to succeed that will keep you going. You determine what you want to happen and you dedicate yourself to doing whatever it takes to make that happen. If you need better skills in your chosen profession, take classes, read books, listen to tapes (available at the library free!) and get a mentor or partner in the business who knows more than you. Join or start a mastermind group of friends who can help and support you and each other. 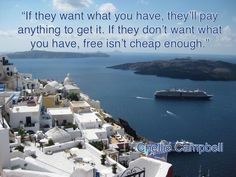 Read all my past newsletters in the archives on my web site at www.chellie.com. Follow every instruction and do every exercise in my books “The Wealthy Spirit” and “Zero to Zillionaire”. You can get them free at the library and I wrote them to help people who couldn’t study with me personally. You can do your own self-study program. I am also writing a daily blog atwww.chellie.com/blog which can help you. Affirmations work–to put you in the mindset to take action to achieve your goals. The hardest time to do them is when you most need to do them. And you have to act your way into feeling happy and rich while you’re doing them. Your subconscious mind can’t tell the difference between the truth and a lie. So, eventually, what you tell it actually becomes true. And that’s when the magic money clicks in – when you’re not looking for it, when you’re busy doing work that helps people – that’s when all manner of unforseen events occur and people send you gifts of money, you win a cash prize, you find money in the street, someone pays you back money you forgot they owed you. The Universe is waiting to shower gifts upon you, but you can only receive them through your happy, joyful, positive thoughts and actions. Your desperate, needy entreaties only get you more of desperate, needy situations. See? Good luck! I wish you the very best of success and abundance.